It’s funny what you do on holiday, you know like designing games and stuff! So back in 2012 or was it 2013?, for copyright reasons let’s say 2012, we where on a family camping holiday and I decided to try devise a way of keeping the kids entertained or interested with something non-screen based, as you do! 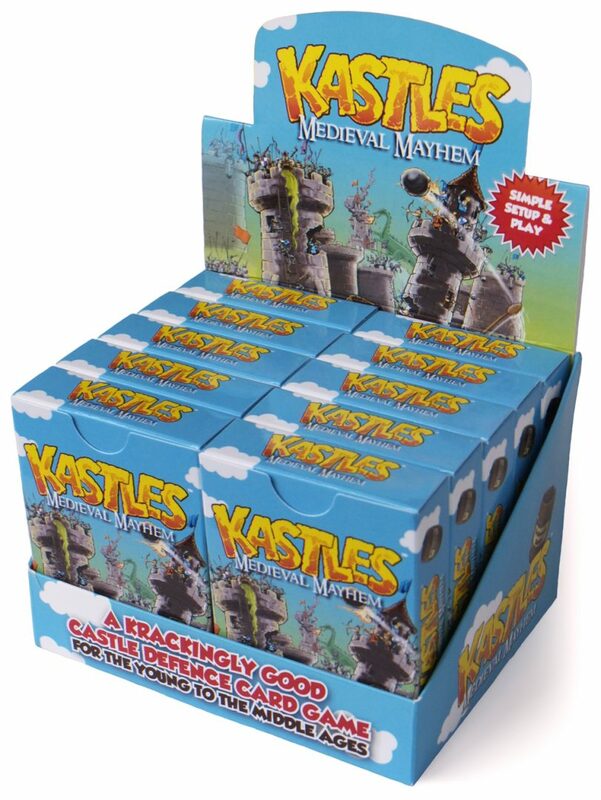 My son loved castles and soldiers at that time (around 8 or 9) and we have always enjoyed playing card games, board games and everything from traditional family games to fantasy and role-playing games, especially independent ones, so therefore we set about creating Kastles the card game. Here’s how we did it. 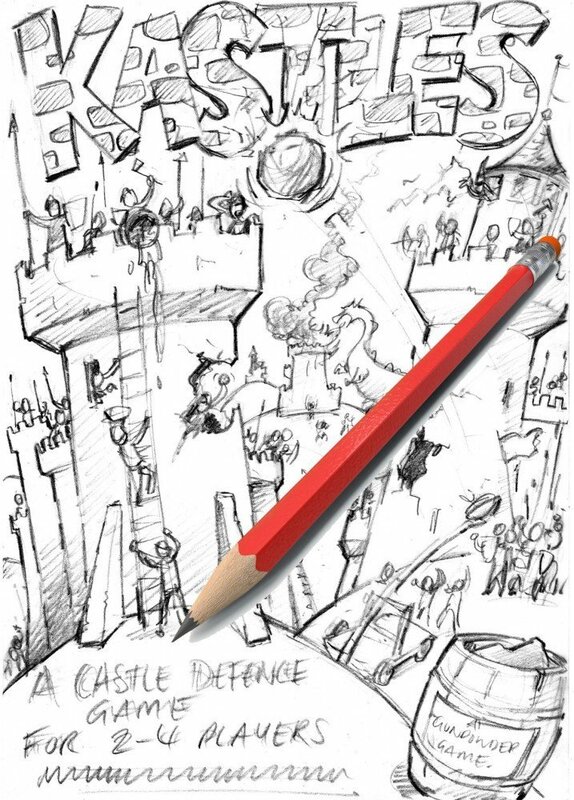 We started with a simple idea, ‘defend your castle and destroy your enemies’ and sketched out some rules along with allocating some cards to different elements of the game. Once the word spread on one campsite we had kids waking us up at 6.30am to play Kastles! Keeping it simple we managed to get a working prototype up and running in a day or two. After a while we had a working set of rules and played it over and over again, testing and re-testing but always bringing it back inline with the initial idea so as to keep the game play fun and simple. I quickly jotted down the mechanics of the game so as not to forget them and Kastles was born. Well version 1 (beta) anyway! Over the next few months we designed and produced the cards and packaging for printing, i asked a friend who works in the board game industry to help draw them up and although I am an illustrator myself i wanted them to look a certain way. Once the first version was ready to go we found locating a decent printing company was a bit of a fiddle but we found a great one based online who gave us a decent price for 100 starter packs. Once they arrived we started selling the games and put a small profit away for the next batch, its quite expensive to get a pack of good quality playing cards printed whilst keeping the costs down and the standard up, if you print a lot you can reduce your costs. Anyway we sold out of the first 100 packs, got some nice feedback, re-jigged the cards, re-wrote the rules to make things even easier to play and printed our second batch. We are happy with the 2nd edition and feel it’s been a fun project so far. We eventually went with a Cambridge based card printing company called Ivory Graphics who were really helpful, super friendly and very professional. They guided us through the process and even highlighted a few errors which we quickly corrected. It’s important you can talk to your printers on the phone so China, whom may seem cheaper to start with, did not work for us, if you have a problem you need to be able to talk to someone and Ivory worked out pretty much the same price per pack. We had lots of requests for extra rules but needed to keep the game true to it’s original idea so added a page on the website with some fun additional rules. We are now planning some expansion packs and hopefully the game will grow in the right direction. If you have an idea these days it’s not hard to get it out there. Here’s a list of things we have learnt from creating our game. Make sure you stick to the original idea as it’s easy to get side tracked and once you get into the production you can lose site of the original game idea. Ask friends and family to play test it for you but don’t over stay your welcome. Family and friends will always help but do as much testing before hand and buy them a beer to say thanks, especially the kids. Look around for quality playing card printers, we found there are a lot of cheap card printers out there and this will kill your brand and your pocket, better to pay a little more for a quality product. Get them to send samples first. Don’t always look at the competition or you’ll never get going and keep your enthusiasm fresh. Check the name as this could be a copyright problem. Thanks to www.own-it.org for their free start-up advice on IP and copyright of the game. Don’t give up! Once you start a project it’s sometimes hard to find the mojo to finish it (if it’s ever really finished). Take a break then come back to the project if it starts to become a grind as it’ll will be worth it in the end. Proof read all your work before printing. My lovely wife read through the initial rules and said “this needs editing”. She re-wrote the rules a few times and it’s now simple and easy to play. You have about 3 minutes when a game starts before they reach for the trivial pursuit. Saying that it’s a balance of spending a little time learning the game so you get a good play. Always find the rule reader, every home has one, in mine it’s my brother Paul. What a nerd! Finally, don’t be shy, once you have it ready to go get it out there via Facebook or Twitter and even consider a game convention. You never know, you could be the next big Christmas No 1. Start a website to get your game out there, we build websites so we have this covered, but try wix.com or even start a Facebook page it’s easy to get an online presence these days. Things are shared all over the world with a click of a button. Amazing! Finally a few thank yous. Original game design by Tim Sharville plus a big thanks to all the fantastic kids and friends who helped with the play testing of Kastles (Burgers are on me if we make it big;). We played it again and again and again and ran it through it’s paces. I have many wrecked packs to prove it.